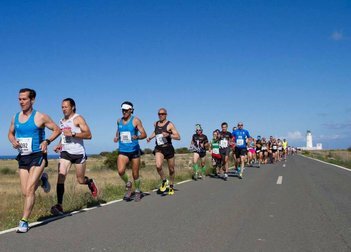 The Formentera Council's offices of tourism and sport will lend support to the tenth Formentera to Run, a run in which participants traverse the island in multiple stages, covering a total of 60 kilometres. The competition, whose distinct legs vary in length from 9 to 21.1K, kicks off Monday, May 28, and continues to Saturday, June 2. Participants can choose between two modalities—traditional race, and, for participants keen on a more relaxing tour of the island, Nordic walking. Race winners will be determined based on combined total time across the individual stages. Every runner who completes the race will receive a medal for participation. For the last five years, Formentera to Run's crowning event has been Formentera Trail 21.1. The tradition continues on Saturday (June 2) and participating runners can opt to have their times considered separately or as part of an overall score. The demanding circuit offers up a 420-metre ascent and takes runners on a path that crosses la Mola from the lighthouse before descending camí de s'Estufador to Migjorn beach. From there, runners make their way back to la Mola via the Camí Romà towards their final destination, the lighthouse. 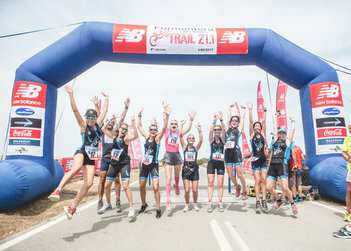 Formentera to Run joins a brimming calendar of sports fixtures (Far a Far footrace, the half marathon and the "Marnaton" among them) that is aimed at showcasing Formentera as a low-season destination for travellers and fitness fans as well as promoting active lifestyles among islanders. CiF chief Jaume Ferrer and Pep Mayans, chairman of the island's league of small and medium-sized businesses, struck a deal for training, business consulting and coordination with the Council's trade department on campaigns to help small-business owners give a boost to competitiveness, innovation, design, quality, promotion and employee development. The deal enshrines the administration's €22,000 pledge to the PIMEF (Petita i Mitjana Empresa de Formentera) for projects giving local business owners tools to recalibrate strategy and remain adaptive and dynamic. The PIMEF will host an educational series during quiet periods of the 2018 calendar, a reflection of the group's goal of reaching an ever broader range of participants. Classes will explore hiring strategies, internet sales, photography, marketing, communication and social skills. Consultancy will also be provided to islanders interested in creating their own business as well as local proprietors of enterprises already in place, on topics such as preventing workplace risks. The arrangement would see the PIMEF chair collaborating with various arms of the Council—the trade department (to design campaigns in the style of Compra a Casa), the conselleria for culture (on research into cultural patronage), the office of tourism (on management and content upgrades to the Formentera 365 app). It would also extend to promotion of Save Posidonia Project, reaching out to owners of local businesses, restaurants and service-oriented enterprises for the door-to-door initiative. 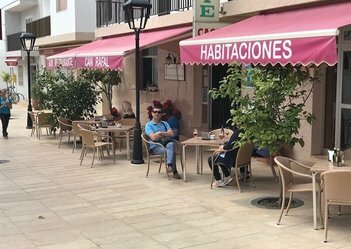 The Formentera Council land and tourism offices remind the island's business owners that a new ordinance took effect on January 31 regulating outdoor installations like terraces. Occupancy permits issued under the previous ordinance are now invalid, and business proprietors who wish to exercise activity on the public thoroughfare must once again request authorisation for any outdoor instalations. Article 10 of the ordinance (available on the website of the CiF office of urbanism) sets out the supporting documentation necessary to request a permit. A reminder: under the new by-law, permits will not be granted to establishments that fail to guarantee business activity between May 15 and October 15. Formentera's office of tourism presents the latest “Discover Formentera in May”. The campaign, in which the Formentera Council helps coordinate tourism-friendly events, offers the island's visitors deep discounts on ferry rides, car hires, accommodation and other low-season perks. Among this year's standout features is Formentera Fotogràfica, set to kick off this Friday, April 27, and continue to Tuesday, May 1. The pro event is open to photography lovers of all stripes. Also set to hit the island this May is Formentera 2.0, where online communication and digital culture will come together under one banner for four days beginning Thursday, May 3. For more information, visit www.formentera20.com. Culture and music hold premier spots on this year's Discover Formentera in May bill. First, there's the 2018 inaugural edition of l'Inhòspit from May 3-5 (Thursday through Saturday). 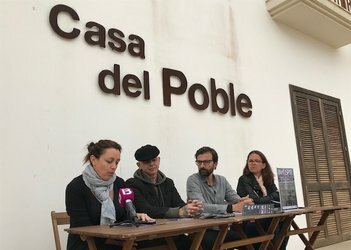 The sampling of new theatre is part of the social and cultural programme offered at la Mola's Casa del Poble. A forum for new theatre, dance and performance art, l'Inhòspit consists in three nightly performances at three points across la Mola: in the woods (bosc de ses Planes), at the foot of a windmill (molí d'en Botigues) and in the town square, plaça del Pilar. The event congregates more than twenty artists from different quarters of contemporary theatre and eight troupes—two from the island, one from Eivissa, two from Mallorca, two from Barcelona and one from Wales. Descending upon the island from May 31 to June 3 is Formentera Jazz Festival. Formentera's artisan markets get under way the first weekend of the month—one more reason to visit the island in May. Another sports fixture in the offing is the island's half marathon on May 12. Then, May 24–26, there's the Marnatón (a merger of mar, or sea, and the Spanish word for “marathon”) and the tenth Formentera to Run (May 27–June 3). The thirtieth Penyal d'Ifac regatta rounds out the bill from May 31 to June 2, for jam-packed month of fitness- and eco-friendly tourism. Another main draw this May is the island's promotion of local gastronomy, an initiative known in Catalan as Caps de setmana Gastronòmics. Numerous island eateries join the fine-dining cause this year as the initiative unfolds over the first two weekends of the month (May 4–6 and May 11–13). Participating restaurants offer gastronomic samplers at €20 (drinks not included), featuring dishes specially tuned for the occasion. Whether the food is traditional or represents a rehashing of an old favourite, dishes are always fresh, creative takes and are priced to move. Visit www.formentera.es for all the details.